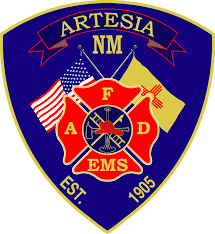 An Artesia woman was arrested Tuesday on arson and child abuse charges relating to a March house fire. State Fire Marshal J. Hill was contacted March 22 by Artesia Fire Marshal Brenden Harvey in reference to a structure fire that had occurred that day at 609 N. Second St.
Investigation indicated the fire had been incendiary rather than accidental and that an accelerant had been used to ignite a mattress and other combustible materials in the home’s master bedroom. During the search for a possible accelerant, an empty rum bottle was located upside down in a bathroom sink. The fire marshals interviewed resident Jennifer Driver, 26, who lived there with her boyfriend and two sons, one of whom was home at the time of the fire. Driver told investigators she had seen smoke emanating from a heater vent in the kitchen and had grabbed her son and exited the home. She stated she did not know how the fire had started and that shortly after she exited the home, her boyfriend came running from the backyard to the front and, along with his work partner, had attempted to extinguish the fire through the bedroom window with a garden hose. Investigators noted Driver had been texting her boyfriend prior to the fire, and that the time of her last text to him and the time of the structure fire call to the Artesia Fire Department conflicted with what she stated she was doing prior to the fire. Upon interviewing Driver’s boyfriend, investigators were told the rum bottle found in the bathroom had been unopened and atop a dresser adjacent the bedroom door when he left for work that morning. Investigators also received a written statement from another individual who had come to town to help Driver’s boyfriend clean up debris from the fire. That person noted most of Driver’s clothing and other personal belongings were not found in the master bedroom but stored inside vehicles outside. A second individual stated Driver had dropped a lock box off at her residence a week prior to the fire, which contained jewelry and pictures that had been sitting out inside the residence. Driver’s boyfriend additionally found her purse, containing her ID, birth certificates, and vehicle titles, inside his pickup. Driver had previously told investigators her purse and ID were destroyed in the fire. Based on the evidence gathered and witness statements, investigators found sufficient evidence to determine Driver had intentionally started the fire and, as her son was home at the time, placed his life in danger. She was taken into custody by Artesia Police Department officers Tuesday and charged with arson (property damage over $20,000), a second-degree felony, and third-degree-felony abandonment or abuse of a child. Cmdr. Lindell Smith of the APD said APD detectives worked together with Hill and Harvey on the case.